The head of U.S. Northern Command expects that additional active duty troops will supplement the 5,239 already slated to deploy in support of the Trump administration’s efforts to stop a migrant caravan making its way through Mexico. At the same time, Gen. Terrence O’Shaughnessy again denied sending thousands of troops to the border was part of a political stunt ahead of next week’s midterm elections. Shaughnessy told reporters at the Pentagon on Tuesday that additional forces could be required depending on future requests from Customs and Border Patrol (CBP). A U.S. official told ABC News that 2,000 active duty troops have already been placed on “prepared to deploy” orders in anticipation of those requests. When asked if the U.S. military was being used as part of a political stunt, O’Shaughnessy noted that the U.S. military routinely partners with the Department of Homeland Security on a host of operations. However, previous administrations, including Trump’s, have utilized National Guard troops, not active duty forces for border security. “I firmly believe that border security is national security and with that in mind that we are in support of Secretary Nielsen and her efforts to secure the border,” the general said. According to O’Shaughnessy, approximately 1,000 troops have already been positioned at bases in Texas joining an additional 870 stationed at U.S. Army North in San Antonio. U.S. Air Force General Terrance J. O’Shaughnessy, Commander of the North American Aerospace Defense Command and U.S. Northern Command provides guidance during a planning and operational update briefing, Oct. 28, 2018. More forces will continue to deploy to Texas, Arizona, and California by the end of the week and New Mexico is expected to receive forces as well in the future. He could not say when those forces would make their way to the border saying that would be done in coordination with CBP in the future. Among the units deploying to border states this week are two aviation units from the 82nd Airborne at Fort Bragg, which could be used to transport CBP agents to more remote areas along the border. Those units will head to Lackland Air Force Base in Texas and Davis-Montham Air Force Base in Arizona by Friday, according to Defense Department planning documents obtained by ABC News. The aviation units are among ten listed in the planning documents which are slated to be in place by Nov. 2 and conclude their mission on Dec. 15. They represent a fraction of the approximately 5,200 troops approved for the border security mission stood up in response to the migrant caravan — still more than one thousand miles from the U.S. border. It’s unclear if the caravan, which is reportedly moving about 25 miles each day, could arrive at the border in that time. Lackland AFB and Davis Monthan AFB, along with Camp Pendleton in California will serve as staging areas so the active duty troops can receive training on the rules of engagement and CBP procedures when they are eventually deployed along the border. O’Shaughnessy did not have a timetable for when the active duty forces would be sent to areas directly along the border. The military and civilian team at DLA Distribution San Joaquin is performing a visual of the outgoing shipment. Planning documents show that several military police companies will head to Lackland and Camp Pendleton in California, while two medical companies will deploy to Lackland and Davis-Montham. Additionally, a headquarters unit from the Marine’s Corps Special Purpose Marine Air-Ground Task Force (SPMAGTF) out of Pendleton will travel further south to San Diego. Imagery released by the Defense Department online suggests that other units already participating in the mission, dubbed Operation Faithful Patriot, include the 89th Military Police Brigade’s Task Force Griffin out of Fort Hood and the 19th Engineering Battalion out of Fort Knox. Federal law stipulates that active duty forces cannot act in a law enforcement capacity, and, therefore, will be limited to acting in support of CBP. Units are expected to provide CBP with planning assistance, engineering support, and fixed and rotary wing aviation, as well as provide personal protective equipment for CBP personnel. 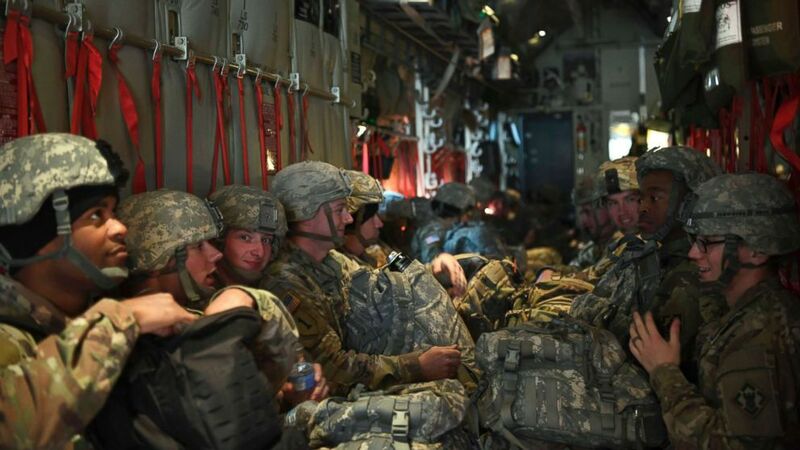 The 5,239 troops approved for the mission — more than double the number of U.S. service members deployed to Syria — will join approximately 2,100 National Guard troops deployed to the borders of Arizona, New Mexico, and Texas on a similar security mission since last April. Previous presidents have ordered the military to support anti-drug smuggling operations and active-duty troops still do so. Trump has publicly declared that the migrant caravan, which he says contains Middle Easterners and terrorists, will be a central issue for the 2018 midterms just days away. The caravan, once 7,000-strong, has dwindled to about 3,500 men, women, and, children largely escaping poverty and violence in Central America. O’Shaughnessy said that the U.S. is “working closely to understand the nature and makeup of this caravan.” He would not say if terrorists were among the migrants, but told reporters that the caravan has differentiated itself from previous groups because of its level of organization. The general also expressed concern that elements of the caravan had used violence when crossing into Mexico from Guatemala. Despite suggestions by Trump to Fox News on Monday that tents along the border could be used to house migrants who have applied for asylum, O’Shaughnessy told reporters that the tents, along with building facilities, would only be erected to house CBP personnel.